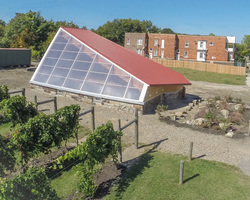 Vineyard - Neighborhood Solutions Inc. Starting in May of 2010, weeds were burned off of the three-quarter acre inner-city site, the ground was turned over and topsoil was trucked in. 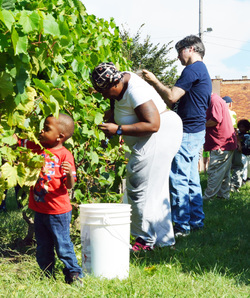 A small army of volunteers, both children and adults, from the surrounding community and local nearby institutions helped to plant the vines and performed other tasks. The vineyard is comprised of 294 vines, set in 14 rows, 21 plants per row; half Frontenac, half Traminette, both cold-hardy varieties of winemaking grapes. The first harvest in 2013 produced a 2nd place award winning Triminette at the 2014 Geagua County Fair. The heavy lifting (cutting down trees and constructing the trellis super-structure), however, was done by residents of a nearby halfway house, augmented on occasion by work crews performing court-imposed community service. Grass was planted in the rows by mid-September...on time and under budget. The master plan is to establish enough vineyards in Cleveland so that the ultimate goal of building an inner-city winery becomes a reality. However, even if the winery never comes to pass, the effort of rebuilding the community, and the new friends made in the process, has made the project very worthwhile. 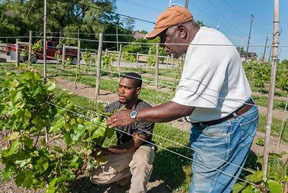 "How A Winery is Transforming Cleveland's Most Notorious Neighborhood"
“Château Hough: Cultivating a Community Vineyard,” edible Cleveland, Natalie R. Schrimpf, Fall 2015 Click link below.